The program, which the creators have dubbed Simulated Inanimate Model for a Physical Learning Experience, or SIMPLE, is the brainchild of Ahmed Ghazi, M.D., M.Sc., an assistant professor in the Department of Urology, and Jonathan Stone, M.D., a Neurosurgery resident who also holds a masters degree in biomedical engineering from the University of Rochester. The process entails converting images obtained from medical scans into computer generated designs and, through the assistance of 3D printing, fabricating lifelike organs that can be poked, prodded, and dissected. Developing the method of fabricating lifelike artificial organs was a process of trial and error and began more than two years ago when Ghazi, a urological surgeon and educator, was introduced to Stone who has a background in engineering, a passion for developing new medical devices, and, most importantly, access to a 3D printer. The process begins with images obtained from MRI, CT, or ultrasound scans into computer-assisted designs (CAD). Instead of using these designs to create rigid plastic replicas of human anatomy, which was already being done in many other places, the pair instead converted the CADs of organs into molds, or negatives, which were built using a 3D printer. In a process akin to casting a bronze statue, the molds are then injected with a hydrogel which, after freezing, assumes a solid state. The water consistency of the hydrogel is identical to that found in our bodies giving the artificial organs the same feeling as the real thing. A great deal of research and experimentation went into the process of formulating the hydrogel so the final product had not only the right consistency but was also the correct color. “We think of it as a science and engineering, although at its heart it is really arts and crafts because at the end day we are creating sculptures that just happen to be anatomical,” said Stone. In collaboration with the University of Rochester Department of Biomedical Engineering, the team also subjected the models to a battery of scientific tests to ensure that the end product had the same mechanical properties as real tissue. They also compared the performance of surgeons on the models and in real patients and found that there was a correlation between the two. The simulations have also been recognized during annual meetings of the American Urological Association, the nation’s largest organization of urologists, which awarded video presentations of the SIMPLE program with top honors in 2015 and 2016. Once the basic models of human anatomy were created, the pair began to tweak the designs in order to change the pathology. For example, they would alter the concentration of the hydrogel to add a denser tumor mass to a liver, or a blockage in a kidney, or plaque in an artery. Using the 3D printer to create more rigid structures, the team can also create bone to simulate procedures involving the spine and skull. In fact, the potential medical scenarios that the technology could replicate are essentially endless. Just being able to handle and examine a replica of a real organ can provide surgeons with a great deal of insight and information. They can observe where the blood vessels enter and leave the organ and, if it is a cancer model, the size and location of the tumor. They can even cut away at the organ to take a look at the interior. Not satisfied with just creating models of anatomy, Ghazi and Stone wanted to take this process further. They wanted students, trainees, and surgeons to be able to replicate the complete surgical experience, which required not only building the organs of interest, but the rest of the surrounding human anatomy so the entire surgical process of guiding instruments to the right location, moving other organs out of the way, clamping blood vessels, and resecting and removing tumors could be replicated. To accomplish this feat, the team assembles entire segments of the body, complete with artificial muscle tissue, skin and fat, and, depending upon the area of interest, the liver, intestines, spleen, kidney, and other adjacent organs and structures. Artificial blood vessels are connected to bags of red dye that will “bleed” if cut. This was also done with other bodily fluids such as urine or bile. 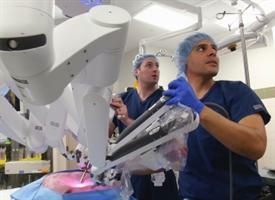 The assembled unit could then be brought into the operating room where it is hooked up to a robotic surgical system, and the entire procedure simulated from the first insertion of instruments to completion. The lifelike nature of the simulation has occasionally caused even trained professionals to do a double take. “We have had times when we are doing these simulations in the OR when nurses or other physicians have looked in the window and thought we were doing the real thing, and have even gone so far as to scrub and put their masks on before coming in thinking there was a patient on the table,” said Ghazi. “As an experienced surgeon, when I am working with these simulations it is often hard to tell that it is not a real patient,” said Jean Joseph, M.D., the head of urologic laparoscopic and robotic surgery in the Department of Urology who has worked closely with the pair to develop the simulations. While the SIMPLE program represents an opportunity for surgical residents to practice full procedures and trained surgeons to keep their skills sharp and learn new surgical technologies, the models are also being used with medical students. The surgical procedure that third year medical students at the University of Rochester School of Medicine and Dentistry are required to learn during their surgical clerkship is a cholecystectomy, the laparoscopic removal of the gallbladder. In the past, medical students have been limited to observing real surgeries or practicing certain surgical techniques on cadavers. Ghazi and Stone have built a simulation of a cholecystectomy which allows students to perform the surgery in teams from beginning to end, requiring them to do everything from making the initial incision, inserting and guiding instruments, and separating, clamping, and removing the gallbladder via minimally invasive surgery. While the simulations can be used to train on a generic model of anatomy, the ultimate vision is to harness this technology so that it can enable surgeons to rehearse complex cases before the patient is brought into the operating room. In these instances, the team can build organs using the actual patient scans, accurately replicating the unique conditions that will be found during the live operation. An example of how this model could improve patient care and outcomes is in a partial nephrectomy, during which surgeons remove a tumor while attempting to preserve as much of the healthy kidney as possible. This procedure necessitates not only that the surgeon successfully remove the tumor and a very small “margin” of adjacent healthy tissue, but that they complete the operation as quickly as possible. The procedure requires interrupting blood flow to the kidney, however, after 20 minutes kidney function will begin to be lost if circulation is not restored, so the surgeon is essentially racing against the clock. One of the keys, therefore, is to avoid surprises and anticipate potential complications which could slow the procedure down. While these events are rare in the vast majority of instances, surgeons will sometimes confront more complex cases due to the size and position of the tumor. In these instances, conducting a dry run of the surgery in advance can help guide the surgeons once the operation is conducted on the real patient. While widespread use of these patient-specific simulations is the long term vision, Ghazi has already used these models to practice real partial nephrectomies case in several instances.